I was in shul today. After morning prayers was a dinner to celebrate the upcoming marriage of a member of the congregation. Along with the benediction said over wine at the start of the meal, there was moderate consumption of alcoholic beverages. After a short while, someone brought out the beer. None of it was twist tops. Every bottle needed an opener. I am proud to say that not one person asked for a bottle opener. There are so many ways to open a bottle of beer. Forks, spoons and knives can open a beer bottle in seconds. I could have used my belt buckle, but that would have been socially awkward, so I used the side of a folding chair. A very common way of uncapping a brew is in a doorway. I usually use a key. A friend of mine has used his teeth. I would not dare attempt such a thing. It would only be a matter of time before one would get chipped. The most popular means of opening a beer bottle is with a plastic soda bottle. You simply turn the soda bottle upside down. There is a plastic rim sticking out and you catch it under the edge of the bottle cap. Once you learn how to do it, it's like riding a bicycle. You never forget how. The whole world changes its appearance when you are looking for anything in a room or in the landscape that could be used as a bottle opener. You find yourself examining every detail of the urban landscape for something that might be of use. Look at the room where you are sitting. 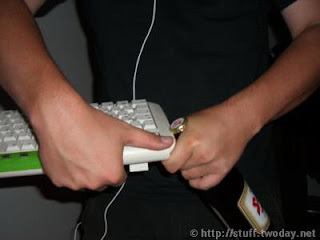 What could be used if you had to open a beer? Did you ever give it any thought? I am not drinking now. I just enjoy the mental exercise. It took me three minutes to find it but I did. My motorcycle helmet strap buckle is perfect as a bottle opener. There are three additional ways of uncapping beverages that come to mind. For those who have not acquired this essential life skill, please do not despair. There is a web site devoted to this essential branch oh human knowledge. I urge readers to check it out. So why does anyone need a bottle opener at all? Ever! Real men don't need bottle openers.